An isolated location, a village in peril, a need for outside agents—the player characters, and a secret long forgotten. These are all the classic ingredients for a type of Dungeons & Dungeons scenario which has been with us from the beginning with T1 The Village of Hommlet and B2, Keep on the Borderlands and continuing with Scourge of the Howling Horde for Dungeons & Dragons, Third Edition and H1 Keep on the Shadowfall for Dungeons & Dragons, Fourth Edition—and beyond! Adventure Module M1: The Terror of Ettinmarsh fits this same pattern. The hillfort village of Anminster sits astride the road through the Ettinmarsh, an isolated stop along a minor trade route, but both trade and travel have been disrupted by bandits and the local lord’s capacity to respond has been limited by the loss of half of his soldiery. Thus, he has need for freelancers—that is, the player characters—to investigate and perhaps put an end to the danger threatening Anminster. All this sounds like an Old School Renaissance adventure for the retroclone of your choice—and it is. Not the retroclone what you were thinking of though, but for Adventure Module M1: The Terror of Ettinmarsh, which is written for use with Classic Fantasy: Dungeoneering Adventures, d100 Style!, the supplement for Mythras which is designed to do Dungeons & Dragons-style adventuring with a percentile mechanic, a stronger emphasis on skills, and the use of passions. Published by The Design Mechanism—and available in the United Kingdom via Aeon Games—Adventure Module M1: The Terror of Ettinmarsh is designed for characters of Rank One and Two. It is intended as an introduction to the world of Greymoor, the setting for Classic Fantasy adventures—surely a nod to Greyhawk, one of the original Dungeons & Dragons campaign worlds, but noticeably does not include a great deal in the way of background about that setting. Instead the given background is very much focused on supporting the set-up for the adventure and its sequels, the first of which is Adventure Module M2: Moonspike Tower. 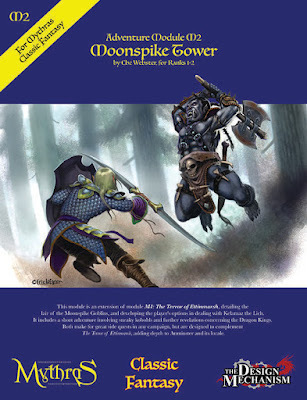 Adventure Module M2: Moonspike Tower is a follow on from Adventure Module M1: The Terror of Ettinmarsh, building on the set-up provided in Adventure Module M1: The Terror of Ettinmarsh, that of an isolated location beset by banditry—in this case, a tribe of goblins. Importantly, what the events of Adventure Module M1: The Terror of Ettinmarsh did was focus on another situation—one confined to the village fort of Anminster and below—rather than the bandit threat. Essentially, Adventure Module M1: The Terror of Ettinmarsh left that plot thread hanging, but its sequel picks up on it and brings it to a somewhat succinct conclusion. Again designed for characters of Rank One and Two, the scenario opens with the both the village and the adventurers being alerted to an attack on a caravan out on the causeway through the swamp. Clues at the burning caravan point back into the swamp and to an ancient tower—the tower of the scenario’s title, once the home of an ancient Elven necromancer and now widely believed to be haunted. Here the Goblin band which has been plaguing the causeway and surrounding area have its base. The six floors of the narrowing Moonspike Tower are described in some detail as are the inhabitants, as there is more to the location than a Goblin lair. In fact, there is a chance that the player characters can roleplay their way through the situation, but there likelihood is that that they will have to fight their way in and up to atop the tower. Notably, there is a strange artefact there that requires the player characters to return to Adventure Module M1: The Terror of Ettinmarsh to activate and if activated will require the Game Master to develop further adventures (though Kefitzah Haderech: Incunabulum of the Uncanny Gates and Portals from Lost Pages may well be useful). Effectively, Moonspike Tower and the Goblin lair wraps up the plot which began in Adventure Module M1: The Terror of Ettinmarsh and brings it to a close. Yet, this only takes up sixteen pages of Adventure Module M2: Moonspike Tower, so what of the other twenty or so pages? Well, some of those pages are given over to monster stats, exactly as you would expect, but the remainder is split into two sections. The first is ‘Tomb Lair of the Kobolds’. Just six pages long, it presents base of a small band of Kobolds which the Game Master can drop in her campaign in and around the Ettinmarsh where Adventure Module M1: The Terror of Ettinmarsh and Adventure Module M2: Moonspike Tower are set. It can be used as a random encounter or a hook is included to draw the player characters to the Kobold lair. Short and detailed, in terms of rewards it deliver more magical items than in previous adventures, but it feels too similar to the Goblin lair of Moonspike Tower in being another encounter with evil humanoids. Nor does it feel like a development of the earlier content in both adventures, when perhaps the rest of the module could have given more information about the area around Anminister and Ettinmarsh. In particular, where the artefact atop Moonspike Tower might lead could have been developed as could the bedraggled settlement of Sunken Veldra, which is marked on the map. The remainder of Adventure Module M2: Moonspike Tower—almost half—is given over to a set of encounter tables. These have been copied from the Classic Fantasy Unearthed Companion and modified for use in the supplement’s default setting of Mystamyr. They cover travel on all types of terrain as well as flight and do include notes on special encounters. In general, should the Game Master want to expand upon possible encounter in and around Ettinmarsh, then the tables are useful. Yet, as useful as the Random Encounter tables are and as decent a mini-encounter/dungeon ‘Tomb Lair of the Kobolds’ is, both feel out of place in Adventure Module M2: Moonspike Tower. Arguably, Adventure Module M2: Moonspike Tower should be concentrating on bringing the adventure and plot begun in the previous adventure to a close. Well, actually it does, but only in the first sixteen pages, leaving the author to fill the scenario/supplement with seemingly random content. So the question is, should the Moonspike Tower encounter really have been included in this adventure at all and instead been included in Adventure Module M1: The Terror of Ettinmarsh? Arguably so, given its length… That would have been allowed room for the encounter with the Kobolds and perhaps another two encounters to support the Random Encounter tables or perhaps some background on Ettinmarsh and the wider area so that a Game Master can create material of her on. Physically, Adventure Module M2: Moonspike Tower matches the standard of presentation of Adventure Module M1: The Terror of Ettinmarsh. It is clean and tidy, lightly illustrated, though not with new artwork. Like its prequel, the module would stand up to better handling with a card cover. The maps are better handled than in the prequel though, and although the area map is presented in colour on the back cover, it does include the location of various places that are meant to be hidden from the player characters. There is no denying that Adventure Module M1: The Terror of Ettinmarsh needed a sequel. After all, it left a big plot hook left dangling… Adventure Module M2: Moonspike Tower does a decent job of providing that sequel and bringing that story line to a close, even offering a guide to using non-violent means. Yet that only takes up half of the module, and whilst the rest of module—the mini encounter and the Random Encounter Tables—is decent enough, the constituent three parts of Adventure Module M2: Moonspike Tower just do not feel as if they should be in the same module. Ettinmarsh and the surrounding area deserves more coverage, it is just a pity that Adventure Module M2: Moonspike Tower does not provide that.